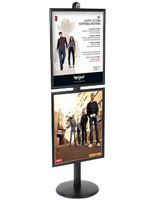 This snap open frame stand promotes ads with style! FOUR 22" x 28" Snap Frames on one Floor Poster Stand! 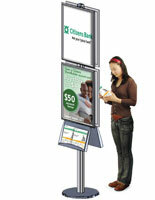 This Floor Poster Stand is an elegant advertising display. 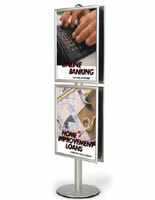 This floor poster stand also known as a sign display, is constructed of sturdy aluminum. 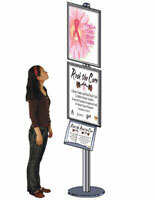 The height of the floor poster stand is 8 feet tall with double sided viewing. 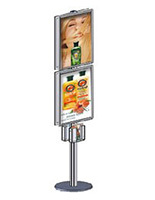 This floor poster stand maximizes the exposure of the ads. There are two 22" x 28" snap frame on each side, with a total of four graphic frames on this unit. 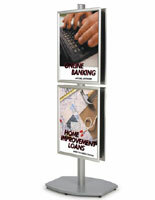 This huge floor stand is an ideal marketing tool for large venues and locations with large crowds. Floor stands are commonly seen in convention centers, exhibition halls, trade shows and large lobbies. 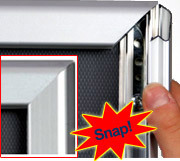 Snap frame are great for frequent and easy graphic changes. To change graphics, simply snap open all four poster frame sides and insert the graphic behind the clear lenses. The snap frames come with non-glare plastic lenses to protect the graphics and are reflection free.